(15/P88) TRENTON – The Christie Administration today announced that the Federal Emergency Management Agency (FEMA) has awarded the state more than $66 million to assist the Middlesex County Utilities Authority (MCUA) with construction of flood walls and related work that will protect two of its critical wastewater pump stations from severe storms and flooding. 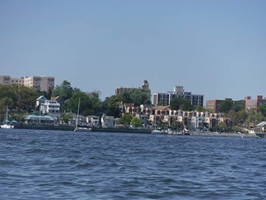 The MCUA’s Sayreville and Edison pump stations were inundated by Superstorm Sandy’s record storm surge in October 2012, causing significant system failures and discharges of untreated wastewater into the Raritan River and Raritan Bay. To mitigate the risk of this from happening in a future severe storm, the pump stations and related MCUA infrastructure will be undergoing a series of significant upgrades and protective measures using a combination of federal funding and financing from the state. FEMA is providing $55.5 million for the construction of a flood wall and related infrastructure for the Sayreville pump station, the primary pump station in the MCUA system, and another $10.6 million for the construction of a flood wall and related infrastructure for the Edison pump station. Across the state, operators of wastewater and drinking water infrastructure are in the process of designing or have started work on a variety of storm-resiliency projects, including replacing and hardening of pump stations, restoring and protecting key treatment and administrative facilities, constructing flood-protection walls and elevating existing walls, ensuring backup power generators are protected, relocating infrastructure to safer ground, and constructing pumping systems to prevent infrastructure inundation. The MCUA serves about 800,000 people in central New Jersey. The new flood walls and related infrastructure will be designed to protect against a 1- in-500-year flood event. The proposed perimeter flood wall for the Sayreville pump station will be approximately 1,700 feet long and constructed with a designed top elevation of 21 feet above sea level, which is above the 500-year flood plain elevation and takes into account waves associated with storm surge. The actual height of the wall will range from five feet to nearly 14 feet above grade, accounting for the existing elevations above sea level of the surface of the ground. The wall will be constructed using cast-in-place concrete supported by piles and underlain with a steel sheet-pile cutoff wall, extending up to about 30 feet below grade. A 24-foot-wide flood gate will be installed at the station’s entrance road. The station will also be equipped with a system to prevent flood waters and storm surge from backing up and inundating the pump station. A stormwater collection and pump-out system will also be constructed to control stormwater within the flood wall containment area. In addition, the existing electrical substation will be relocated to the northeast corner of the facility, allowing for construction of a stormwater overflow basin and new emergency backup power system will be constructed. The proposed concrete flood wall system for the smaller Edison pump station will be approximately 650 feet long with a design top elevation of 23 feet above sea level. The pump station will also be equipped with a system to collect and pump out stormwater. Costs not covered by the FEMA grants will be funded through low-interest loans provided by the New Jersey Environmental Infrastructure Trust, in partnership with the DEP.